Welcome to our unique ‘ASTRONOMY OUTREACH’ program for primary schools. Designed by Dave Reneke from Mid North Coast Astronomy as an interactive visual astronomy/space show, it makes learning fun. This program is unique! Fully focussed on the student educating them in an interactive way about the many wonders of the night sky and focus on our closest star- the Sun. Throughout each 20-30 minute talk we’ll will be using the latest, most up to date visual material available from NASA and the Hubble Space Telescope. We focus mainly on the solar system as well as touching on how the universe came to be and describe what stars are where they’re made of. Afterwards we go outside and let the kids view the Sun with safe solar glasses (a REAL buzz) and also do ‘Solar Projection’– showing the Sun’s full disc with amazing black sunspots projected onto a screen below the telescope. We can also view solar flares shooting out from the Sun. Presented to in a fun way, the program is suitable for students from all primary school levels, but if need be provision can be made for younger students. We can also do multiple talks on the day. Our requirements are a darkened room, power access and teacher supervision. You students will see and hear things that will amaze them! Cost: $3 per child to cover our time, fuel and set-up expenses. Minimum number: 100 children (No maximum) Schools can combine classes or join with other schools to make up numbers if required. TEACHERS: To continue the lessons and assist in further study we will be leaving a FREE resource pack containing a few pair of Solar Glasses- Solar Viewers – Astronomy Fact Sheets – Space colouring in sheets to photocopy, etc. Note: Inquiring about this program does not place you or the school under any obligation. * “Dave, thanks for a very interesting and informative presentation. I particularly appreciated the effort you made to deliver material relevant to our students. Your visit has certainly helped to maintain enthusiasm in our fledgling science club. Good luck.” Mark Vale. Ashford Central School. NSW. * “The program kept all children from K- 6 interested for 1 hour, not easy to do!” St. Joseph s Gloucester. * ” Excellent! A well presented program, interesting and thought provoking” Gladstone Public. * “Great! Exactly what we wanted”. Helen Wiederman. Beresfield Public School. In just a few hours we will learn a lot about astronomy and space! Students get to hold a real large 4.5 billion year old meteorite! David Reneke, one of Australia’s most well known and respected astronomers and lecturers, . 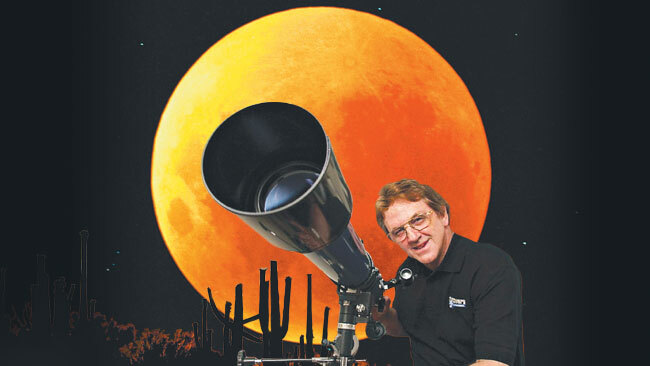 David has over 40 years experience in astronomy with links to some of the world’s leading astronomical institutions. He has an enthusiasm which is infectious, and it shows in his presentations. David is the editor for Australia’s Astro-Space News Magazine and a writer for the prestigious Australasian Science magazine. David teaches astronomy at college level, is an invited speaker at astronomy conventions throughout Australia, a feature writer and columnist for dozens of Australian newspapers, and is a celebrity science correspondent heard on more than 16 ABC & commercial radio stations across Australia every week – total audience, around 3 million! As a new author, David has two E-Books to his credit. David has been featured on Regional TV stations in NSW, Good Morning America, American MSNBC news, the BBC, Spanish television and Sky News here in Australia. He’s recently entertained passengers across Australia onboard the famous ‘GHAN’ with his show and has been invited back in the New Year. David has developed a style of presenting astronomy that is incredibly unique, fast paced and entertaining. David recently toured the USA on a magazine assignment where he met Sir Richard Branson in New York and visited astronaut Buzz Aldrin, the second man to walk on the Moon, at his home in California. David also runs his enormously successful ‘Astronomy Outreach’ program.